The What: Audio-Technica is now shipping its new ATM350a Microphone Systems. Designed to provide crisp, clear, well-balanced response even in very high-SPL applications, the ATM350a Cardioid Condenser Instrument Microphone comes in six specially designed systems that provide discreet mounting solutions for a host of instruments, including woodwinds, strings, brass, percussion, drums, and piano. The What Else: Following in the footsteps of the ATM350, the ATM350a is capable of handling 159dB max SPL, a 10dB increase over its predecessor. This allows the mic to cope with an even greater range of extremely powerful, dynamic sound sources. Like the ATM350, the new mic features a cardioid polar pattern that reduces side and rear pickup and protects against feedback. The mic’s in-line power module incorporates a switchable 80Hz hi-pass filter to help control undesired ambient noise. The Bottom Line: The six ATM350a Microphone Systems combine the instrument microphone with unique UniMount components, giving sound engineers and musicians a variety of mounting options when working on stage or in the studio. 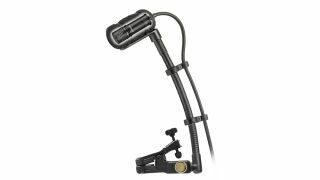 Options include a rugged drum mount, all-new magnetic piano mount, upgraded universal clip-on mount, expandable woodwind mount, and two strong, flexible goosenecks (5 and 9 inches) that can be attached to any of the mounts.